Booty Shapers keep your boots looking great! You know how you find that perfect pair of boots, bring them home, put them in your closet, then when you go to get them they’ve got those crease marks on the side where the top was bent over? Yuck! This happens to me all the time! I imagine lots of girls who owns boots have this problem and don’t know how to solve it. Here’s a great little product that’s so simple and effective that you’ll wish you had thought of it first; Booty Shapers, cute name right! Booty Shapers come in three different sizes to suit all of your booty shaping needs! Extra Large is perfect for knee & thigh high boots, Large is great for calf & knee high boots, and Small is ideal for ankle & calf length boots! They come in a variety of patterns like Paisley Swirl, Tweet Tweet, and an adorable I Love My Boots design, so they are pretty to look at as well as functional. How do Booty Shapers work? I received a pair of the Small sized inflatable boot supports to try out. they were just right for my mid calf height boots. I wish I had found these sooner because my boots already have some creases in them from sitting int he closet. 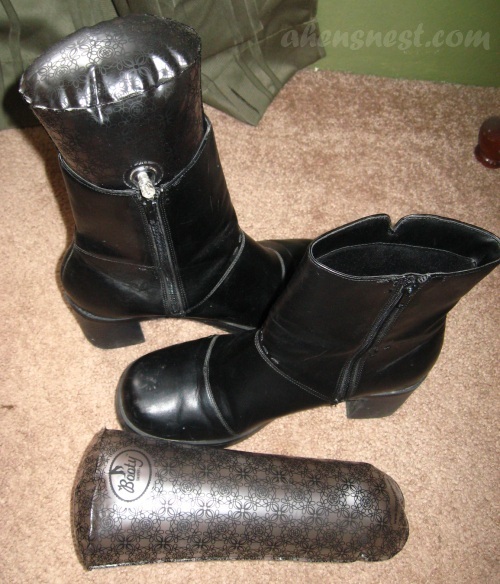 I am confident that if I had been using Booty Shapers from the beginning that my boots would still look like new instead of a bit worn as they do now. You can see how the Booty Shapers push out the sides of my boots to help them keep their rounded shape. See how they are all squished in without the Shapers in place? I need to get a pair of the Large for my knee high boots, I want them to stay crease free! Booty Shapers are a perfect stocking stuffer for the women in your life! They are very affordable at $10 each too! You can find Booty Shapers in CVS, The Container Store, and select Bed, Bath, and Beyond Stores nationwide. You can also purchase them online at bootyshapers.com. I’m so excited that TWO lucky readers will win their very own pair of Booty Shapers! 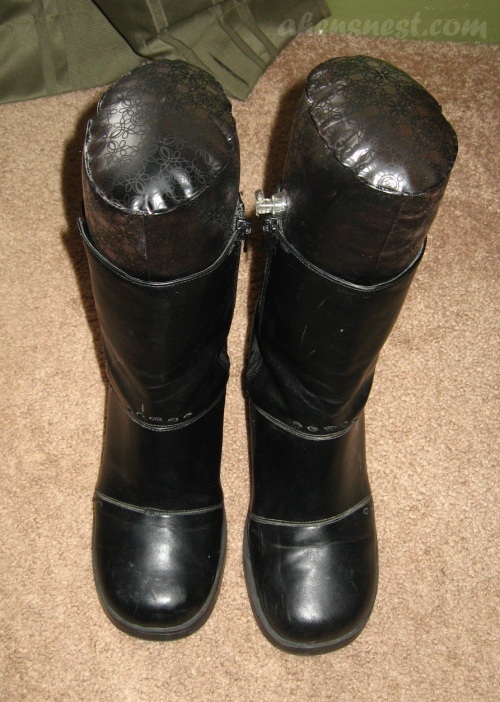 Leave a comment with a tip about keeping your boots or clothes looking great! Rules: Follow the directions above! Giveaway open to U.S., 18+ only and ends January 5th, 11:59 est. Winners must reply to email within 48 hours or I will redraw. Giveaway is Sponsored by Tomoson.com. I received one or more of the products mentioned above for free using Tomoson.com. Regardless, I only recommend products or services I use personally and believe will be good for my readers. I am disclosing this in accordance with the Federal Trade Commissions 16 CFR, Part 255 Guides Concerning the Use of Endorsements and Testimonials in Advertising. Tomoson Product review & giveaway Disclosure. Keep the box for the boots and put them back in them when you are done. Keep the stuffing from them as well and they will never lose their shape. I like Hen’s Nest on Facebook. I stuff wadded up newspapers in my boots to retain their shape…Booty Shapers would be so much better! :-) Thank you. I stuff old shirts in my boots right now. It helps somewhat! I keep all of my shoes and boots in clear plastic shoe boxes. It keeps them clean and makes it easy to stack them AND it’s so easy to see which shoes are inside! I always make sure to wash my best things with delicate wash. I entered your EZ Sox giveaway, too! Fold sweaters , don’t hang them. They’ll get too stretched out. I entered the CSNStores.com giveaway! I entered the ChildhoodWonders giveaway! I entered the EZ Sox giveaway! to keep my clothes looking great, i keep them hanging up in the closet!